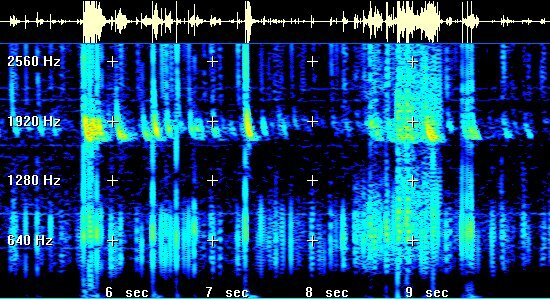 Listen to more VLF samples from the INSPIRE program, including “chorus” and manmade VLF sounds. What is a dynamic spectrum? Dynamic spectra show the evolving intensity of a signal as function of time (horizontal axis) and frequency (vertical axis). 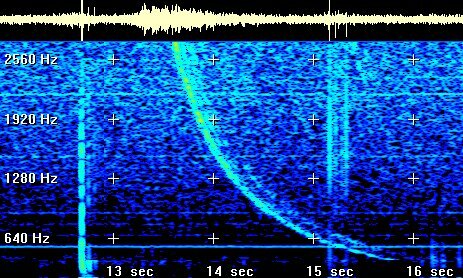 The colorful ones on this page show VLF signals lasting about 5 seconds in the frequency range 100 to 2400 Hz. False colors denote intensity. Black and blue areas are frequency-time regions of relative quiet. Yellow, orange and red are louder. 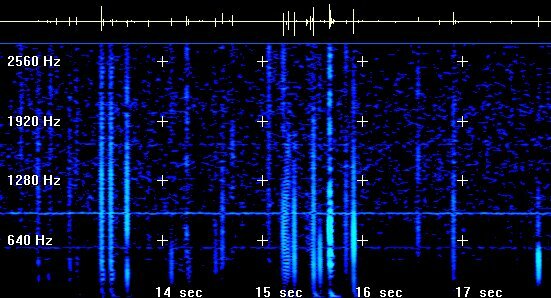 You can create your own dynamic spectra of voices, radio stations, etc., using Spectrogram Ver 5.1 by Richard Horne. It’s free. Like passing freight trains that shake the walls of nearby houses, cargo-carrying proteins shake the cell walls of yeast. Gimzewski’s team measured these tiny cell wall vibrations in a species of yeast used to make bread rise. They performed many experiments to try to understand what makes the cell walls vibrate. They think that the protein freight carriers, also called molecular motors, cause the wall vibrations as they transport everything from bits of protein to whole chromosomes throughout the cell. Since sound is created by vibrations, the scientists also determined how the cell wall movements would sound if they could be heard. If the yeast cell was the size of a human, the sounds it would make would not be like loud music. “They would be more like the sounds of an ordinary conversation,” said Gimzewski. Gimzewski thinks sound is an interesting way to present observations of vibrating cell walls. The movements are too small and fast to be seen on video. To investigate why the cells vibrate, Gimzewski studied the vibrations at different temperatures. They also treated yeast cells with a chemical that prevents the cells from producing energy. The vibrations stopped when the cells stopped producing energy. From these and a few other experiments and calculations, the scientists say that cell wall motion in yeast is probably caused by the activity of many molecular motors working within the cell at the same time. Gimzewski thinks these movements might be useful to the yeast cells. The motion could be part of a communication pathway or a pumping action that helps move nutrients or chemicals from one side of the cell wall to the other. Modulation of cell endogenous membrane potential by an external electrical field influences the structure and function of membrane compartments, proteins and lipid bi-layer. In this work, the effects of applied potential onSaccharomyces cerevisiae growth were characterized through simple yet conclusive experiments. Cell growth time profile and cell division were investigated as macroscopic response to the electrical stimulation. Control experiments were conducted under identical conditions except for the absence of applied potential. Through comparative analysis, electrical stimulation was verified to alter cell cycle as smaller sized population was observed, suggesting that a synchrony in cell division was promoted. Power spectral analysis was employed to sustain synchrony enhancement, and mathematical modeling was conducted for determining kinetic growth changes. Monod type kinetic parameters for growth were determined by non-linear regression. The affinity constant (namely kS) presented a dependence on applied potential suggesting changes on transport across cell membrane. Electrochemically promoted stress was also verified to inhibit growth as well as to induce changes on cell viability. Key words: electrochemical stress, Saccharomyces cerevisiae, cell cycle, viability. Steady-state voltamograms were performed in order to evaluate the eletrochemical stability of the YPD medium, i.e. in what range the medium was eletrochemically stable. The obtained voltamograms are shown inFig. 1. No reaction involving glucose electrochemical reactions was detected in the whole voltamogram for three different glucose contents (2%, 10% and 20% w/v), attesting the stability of the main energy source at this potential range. Additionally, it can be seen that the potential herein applied, +0.75 VSCE, is within the water stability zone. The voltamograms peaks observed in Fig. 1 are due to water decomposition (higher potential) and reduction of dissolved oxygen (lower potential). Thus, important changes on pH are avoided during S. cerevisiaepotentiostatically controlled growth at that potential. ARAUJO, Ofelia Q.F. et al. Electrical stimulation of saccharomyces cerevisiae cultures.Braz. J. Microbiol. [online]. 2004, vol.35, n.1-2 [cited 2015-10-31], pp. 97-103 . Available from: <http://www.scielo.br/scielo.php?script=sci_arttext&pid=S1517-83822004000100016&lng=en&nrm=iso>. ISSN 1678-4405. http://dx.doi.org/10.1590/S1517-83822004000100016.